After spending two nights at the hill-town, Nuwara Eliya, we left for Kadhirgama on the morning of 24th Jan, with a new driver. Sirisiri, the first driver, had left for Colombo in view of the illness of a member of his family. The sky became clearer as we reached, Divirumpola, 15 kms from Nuwara Eliya. Here in a Buddhist monastery is a Hindu temple which houses the place where Sita Devi underwent Agni Pariksha, an incident to which I am not reconciled to in Ramayana. There is also a tableau under a Bodhi tree marking the spot where this Agni Pariksha took place. There is also a statue of Hanuman baring his heart to reveal Sri Rama and Sita Devi enshrined in his heart, carved out of a single block of wood. There are also number of statues of Buddha in a row as in any monastery. After the visit to this temple we also visited a temple of Lord Muruga where like Kadhirkama, a painted screen takes the place of main shrine. From here we went to Ravana falls. It is a thousand feet high waterfall which cascades as several falls. A cave uphill is also called Ravana Cave. It is said Ravana hid Sita Devi in that cave after Sri Hanuman set fire to Sri Lanka before returning to Sri Rama after meeting Sita Devi in Asoka Vana and Sita devi used the pool formed down the falls for her bath during that time. We didn’t go uphill and left the place after spending some time in the fall, which is a scenic spot and a big tourist attraction. Our next stop ws at Kadhirkamam spelt here as Kataragama. Before going to our hotel of stay we had a satisfactory lunch in the city. The place of stay was Gregory safari Bungalow, a sister concern of Gregory Bungalow of Nuwara Eliya. In the afternoon after rest, we started for the famous Kadhirkamam temple. Rain also started as we got out of the van to go to the temple. So with umbrells open we entered the temple complex. This temple is visited with devotion not only by the Tamils but also by the Buddhists and by local tribal Vedda people. In fact I saw a number of Sinhalese carrying offerings in the crowd as we were waiting for the doors to open, since it was evening Puja time and I got a doubt whether I am in the right place. Later I was told that lot of Sinhala Buddhists pray at this temple, There is also a Buddhist temple in the complex and also a mosque, a rare confluence of the three faiths in the same complex. There are also temples in a few other places associated with the name Katargama and also devotees undertake padayatra from Jaffna to this temple every year. The local legend attached to this temple is that Lord Muruga had taken an incarnation in South India by the name of Kataragama. His wife’s name was Tevayani, a Sri Lankan distortion of the name Deivayanai. Kataragama had a quarrel with Tevayani and left her and came to the island of Sri Lanka. He went to the hill called Katirmalai, which was the abode of the tribe called the Veddas (hunters). One day when he was out hunting, he saw the adopted daughter of the Vedda chief known as Valli. The rest of the story is the same as the romance of Valli and Subramanya, as is known in Tamilnadu. For Buddhists it is a venerable shrine because Lord Buddha is supposed to have meditated here. All the Hindu temples in the complex look more like small prayer halls with no Gopuram, carvings or statues. The one housing Lord Muruga is also no different, only it is bigger than others. There is no idol here, only a screen, depicting Lord Muruga with His consorts and behind the screen there is a Yantra, it is said. The priests are from the Vetta tribe and Agama rituals are not observed. Also a Buddhist priest is present during the Puja and the Puja has Buddhist orientation. Besides the main shrine for Lord Muruga, there are separate shrines for Lord Ganesa, Lord Bairavar and Devayani Amman among others. I slipped out of the main shrine mid-way through the Puja, which was not appealing to me and went round few other shrines armed with the umbrella, to return at the closing time of Puja. It was dark and raining at the time Puja ended, and we all returned to the van quickly. The next day was the final day of the tour. We packed our bags and boarded the van for the final leg of tour to Kelaniya, which is near Colombo, before going to the airport for the midnight flight to Chennai. Even as we started, driver wanted to take the highway to Colombo. As toll cost was not included in company’s budget, he wanted us to bear it. We preferred to go through the towns seeing the sights rather than rush through the highway. Even his false statement that Kelaniya temple will close at 6 pm and we will miss it if we do not take the highway did not make us change our resolve. It was good that we did not take the highway as the coastal way to Colombo was very scenic and beautiful. Though we wanted to stop the van for photo shoots in a few places we didn’t ask for it, as driver was already upset he couldn’t prevail upon us to take the highway. He had conveyed his displeasure to the company and they took a different line stating that we have to check in the airport five hours earlier and that is possible only if we take the highway and we reluctantly agreed to take the highway after lunch at company cost. We stopped for lunch at another substandard restaurant in Galle. When we were remonstrating with the driver, a stranger we met there told us in Tamil about a nearby Indian Restaurant. The driver became more upset on hearing about this and calling him names, he took us there. It was really good and we had a good lunch. Then we took the highway to Colombo and reached Kelaniya late afternoon. Kelaniya Raja Maha Viharaya, as the Buddhist temple is called, is seven miles from Colombo. Buddhists believe that this temple has been hallowed by the visit of Lord Buddha. For Hindus also it is an important one because this is believed to be the site of Vibhishana Pattabhisheka. 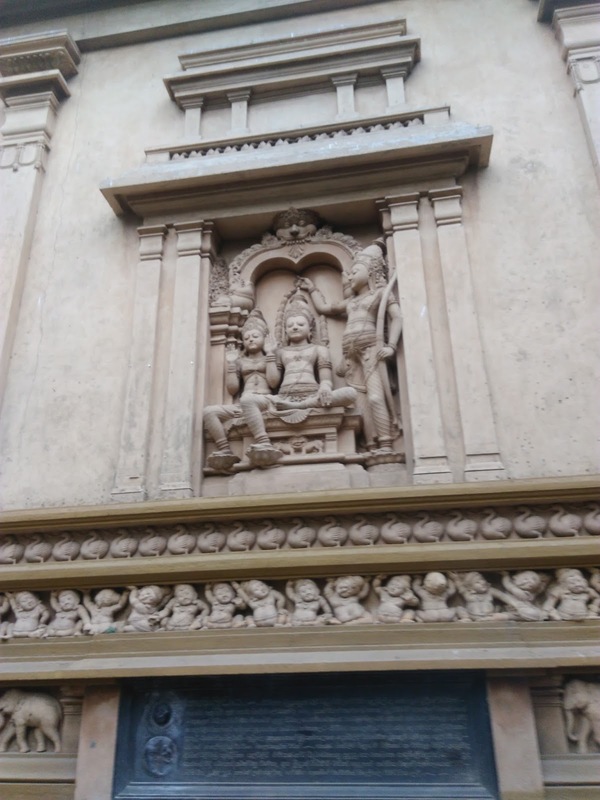 There is a mural here depicting Sri Lakshmana crowning Vibhishana as King of Lanka, in the absence of Sri Rama who had to rush to Ayodhya to save Bharatha from Agni Pravesa. In the Buddhist temple there is a beautiful figure of reclining Buddha besides beautiful paintings depicting important events in the life of Lord Buddha and nice sculptures. There are also murals depicting Lord Ganesha, Lord Vishnu, Lord Muruga among others and also statues of Bodhisattvas. The original temple here also has been destroyed by the Portugese and present one is a rebuilt one. There is also a Bodhi tree shrine here. From here we went to Hotel Clarion Hub, Katunayake for our night dinner. After dinner we proceeded to Katunayake air-port for our wait to board the Spice Jet flight to Chennai that was to leave only at 2.30 AM. When we landed in Chennai we were too tired to wait for each other for a parting greeting and sped our way home to rest after a tiring day capping a nice, evenful tour.